The rap star's big return has a little copyright issue. (AllHipHop News) Fans were overjoyed when Philadelphia rap star Lil Uzi Vert's made his highly anticipated return to music with the release of "Free Uzi." But that joy was shortlived because Uzi's return has been cut short over copyright problems. 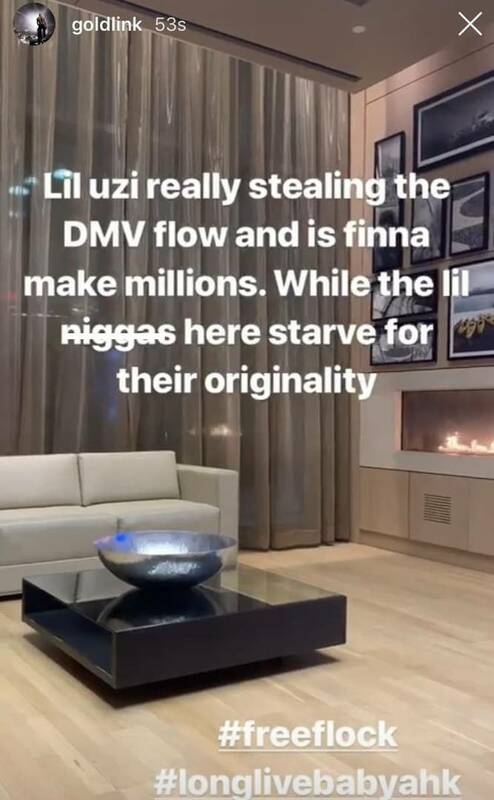 "Free Uzi," which features the rap star rapping over a G Herbo track "Gangway," was pulled from streaming services earlier today, because the instrumental was not cleared. The headache comes in the middle of Lil Uzi's feud with DJ Drama and Don Cannon's Generation Now record label, which the rapper claims is holding his album Eternal Atake hostage. As a result of the label issues with Generation Now, Lil Uzi has reportedly signed a deal with Roc Nation to help work out his business issues. Meanwhile, Uzi may be dealing with some brewing beef with Washington, D.C. rapper Goldlink. Goldlink claimed UZI stole his flow for "Free Uzi" in a post on his social media feed.